New Delhi: Indian Institute of Technology Ropar (IIT Ropar) takes pride to host its 6th Convocation Ceremony this year on 28th November. The convocation will be hosted at the sprawling 500 acres of permanent campus called as State-of-the art campus situated on the bank of river Sutlej and will be operational in 2018. The convocation will be graced by the Chief Guest, Prof. Ashok Jhunjhunwala, Principal Advisor to Minister of Power, New and Renewable Energy, Government of India (GoI). 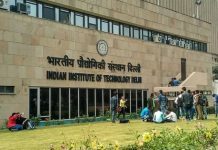 Established in 2008, IIT Ropar has grown to its prominence nationally and internationally through its research initiatives. The campus presently accommodates 1100 students and 120 faculty members. Striving to be the leader in promoting quality education through its cutting-edge research innovations and unique hands on engineering curriculum, IIT Ropar is leading in research and citation among all new IITs. IIT Ropar is stretching its wings and reaching its every milestone with a mission to foster a transformative learning environment and a culture of excellence enabling creation of knowledge and development of socially responsible, enterprising leaders, contributing significantly to national progress and humanity.